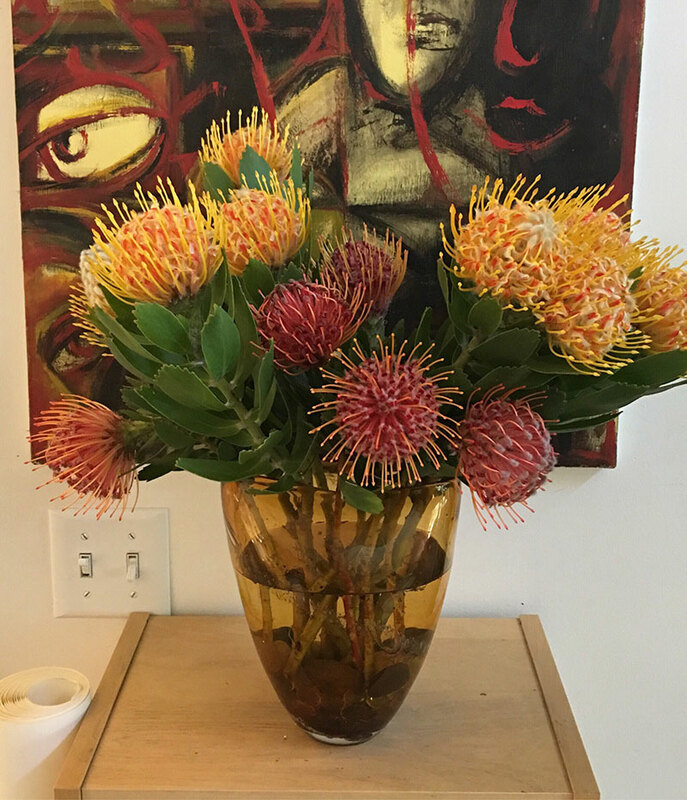 Jen and her daughter Paula walked in the studio door for their Saturday session, arms full of fresh-cut proteas from their backyard. These flowers look like miniature fireworks exploding with vibrant colors. 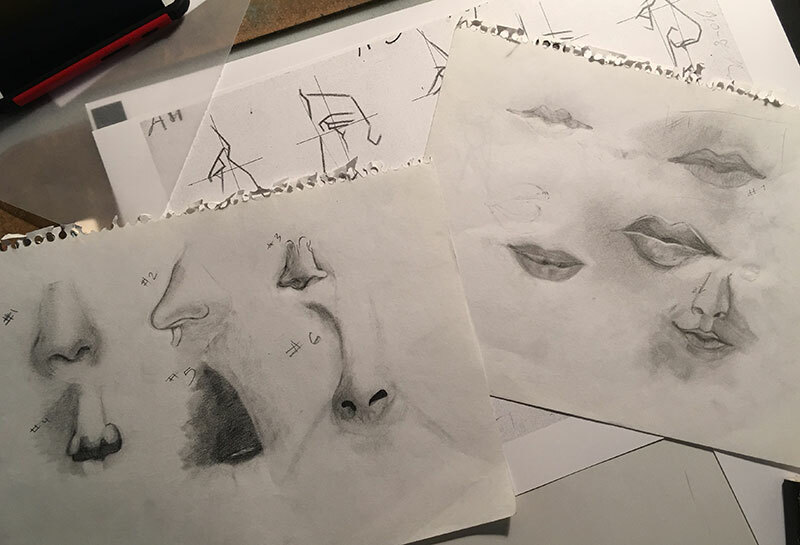 I placed them around the studio for Drawing Lab students to practice gesture sketching, dominant angles, and sensitivity of pressure on the pencil or pen when drawing lines. 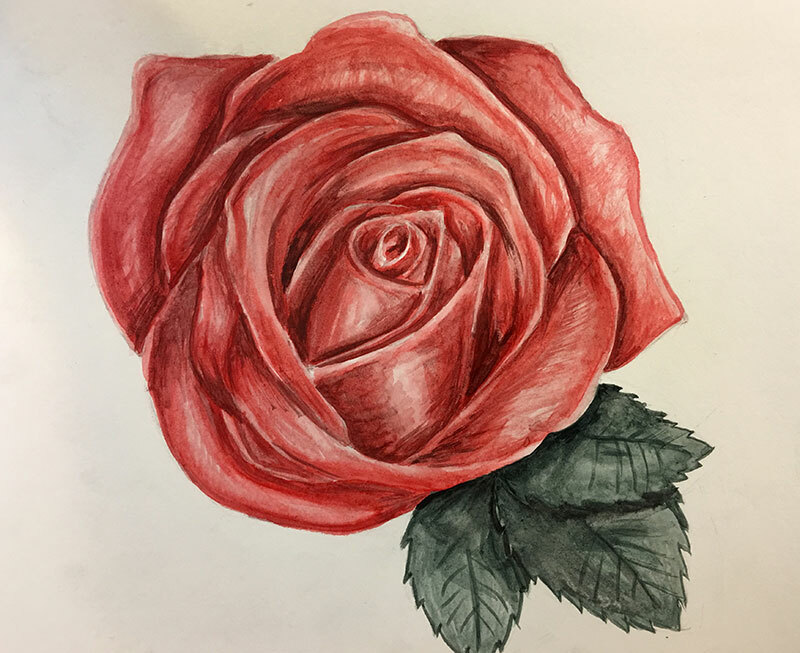 Students responded with exquisite studies on paper. 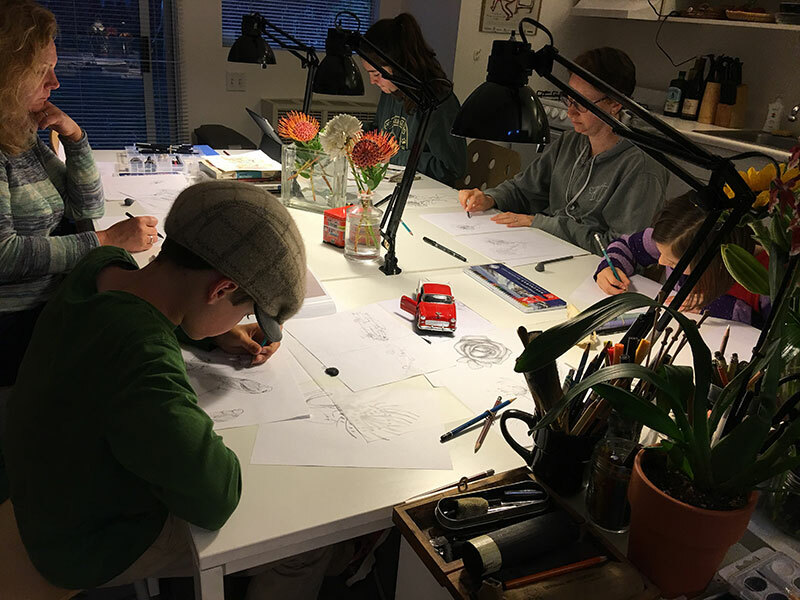 Our youth and Draw With Your Kids Thursday evening session in full study mode. 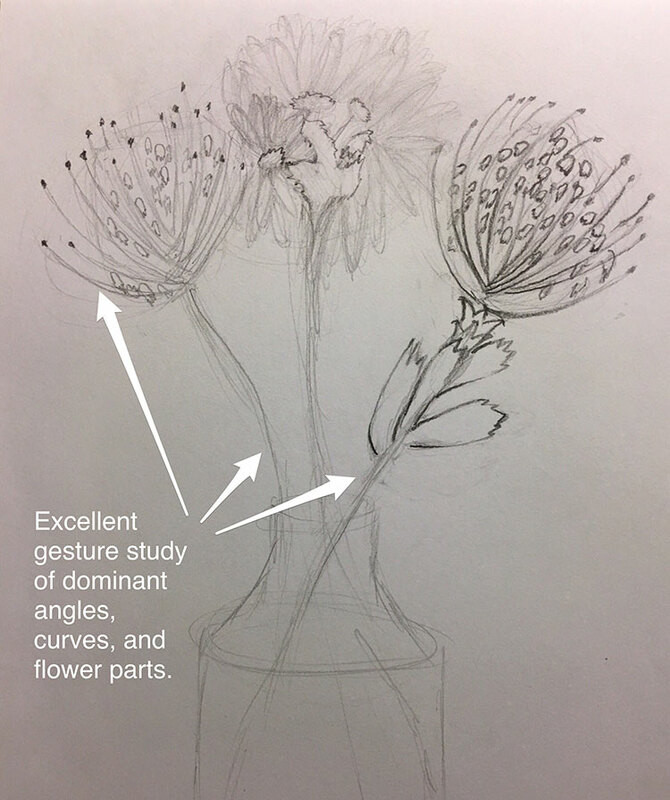 Study sketch by youth sketcher, Scout, shows delicate contour edges and her practice of transitions from the dark pencil points and light curves of the flower parts. 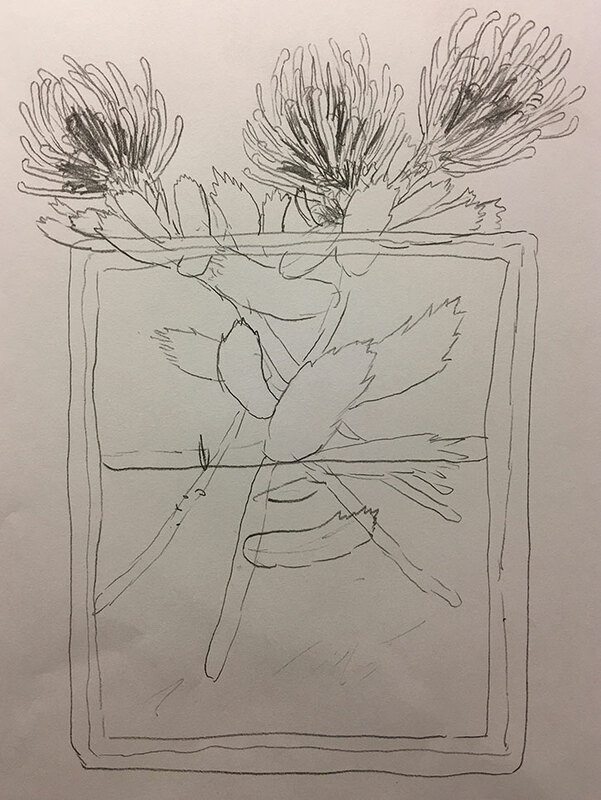 Contour study of proteas by youth sketcher, Devin. With minimal line work he captures the essence of stems and leaves floating in water as well as light and dark values of the flowers. Nicole’s experimentation with watercolor pen brushes during her private session resulted in a gift for her mom on Mother’s Day. Happy Mother’s Day, to all our mom sketchers! 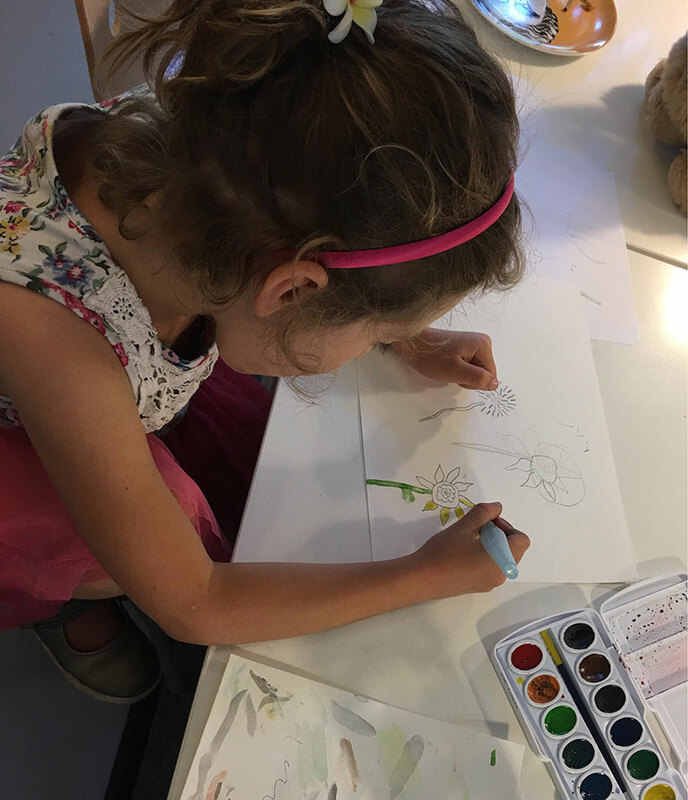 After several studies of learning about different line variations, Naomi goes for her first try using Micron pens and a watercolor brush pen during her private Draw With Your Kids session with her dad. 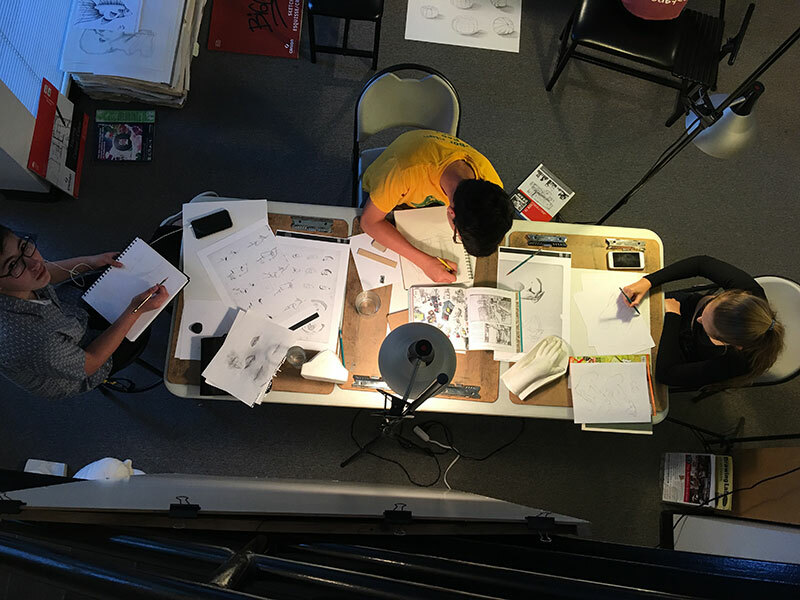 Our budding concept art department sketches the night away. We’re putting together a new program for Level 3 youth sketchers called SketchTribe Youth Design Team. 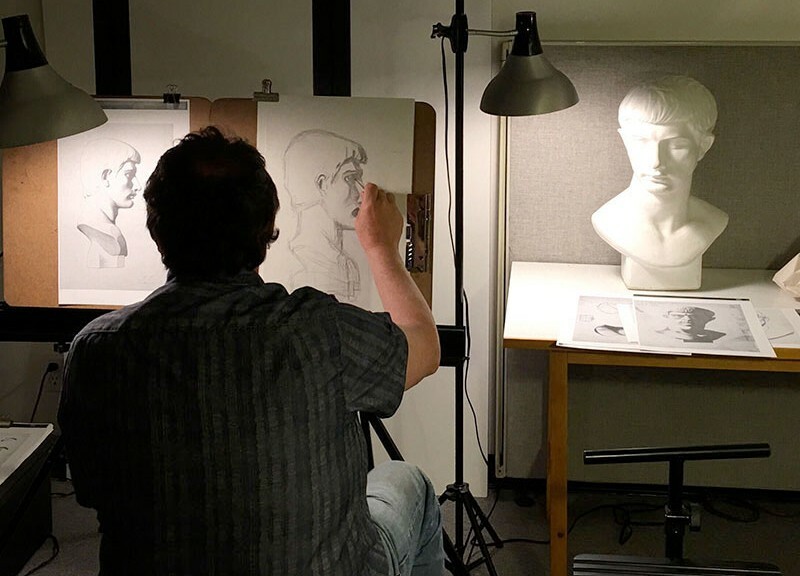 It will be a project-based workshop for improving observational drawing skills and ways to apply those skills in everyday life and future design/illustration careers. Dylan’s studies of facial features and modeling of shadows. 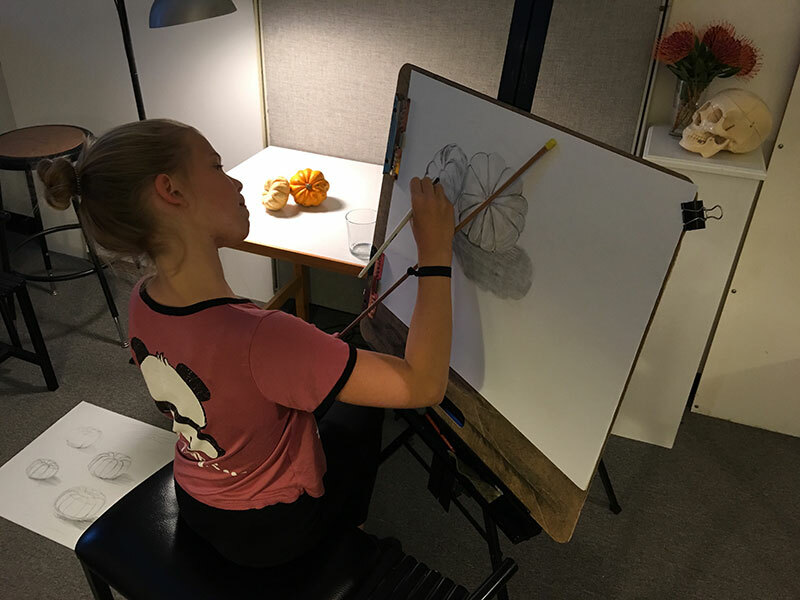 After a six-month absence, it’s such a delight to have youth sketcher, Faith, back in the studio again! 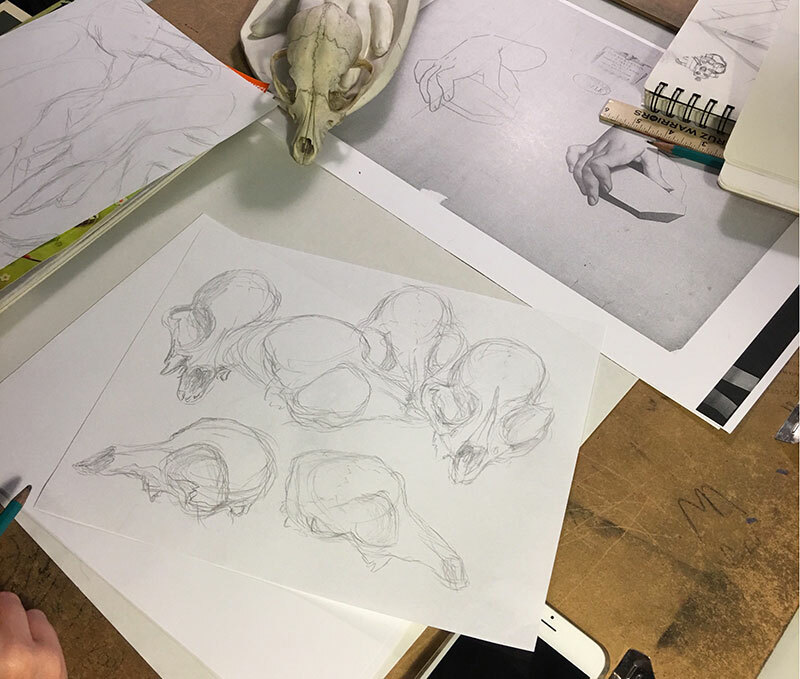 Her contour studies of a dog skull were a great warmup to start the evening. 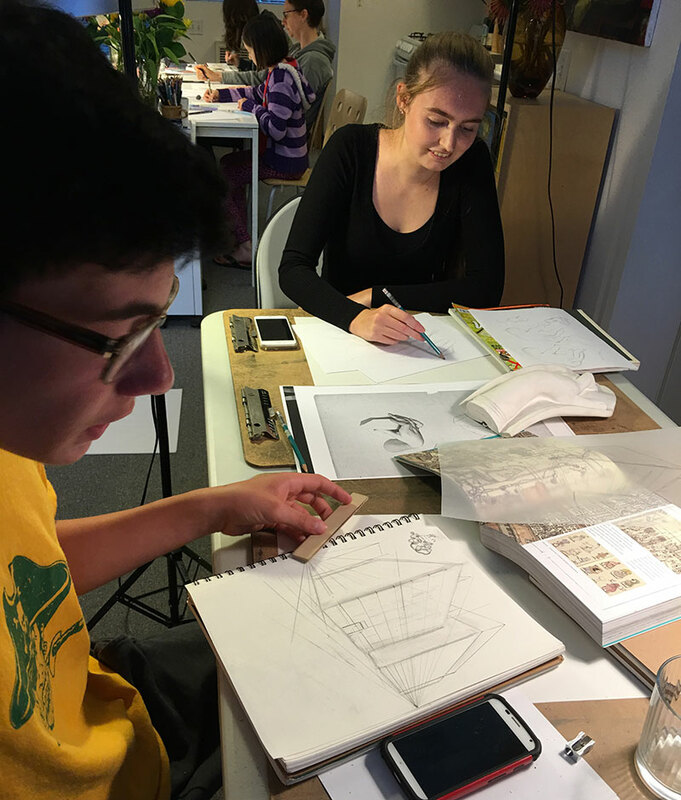 Casey ponders his perspective study of a street scene while Faith sketches the form of a plaster cast hand.